금동여래입상(金銅如來立像)은 호암미술관에 소장되어 있으며 보존 상태가 양호한 높이 25.4cm의 통일신라시대 불상이다. 머리에는 작은 소라 모양의 머리칼을 붙여 놓았고 그 위로는 상투 모양의 큼직한 머리묶음이 솟아있다. 둥근 얼굴에는 눈·코·입 등이 날카롭게 표현되어 근엄한 인상을 풍긴다. 옷은 양 어깨에 두껍게 걸쳐 입고 있으며 U자형으로 넓게 드러난 가슴 안에는 속옷이 표현되었다. 양 다리에 표현된 옷주름은 U자형으로 흐르면서 다리의 윤곽을 드러내고 있다. 손은 오른손을 손가락을 편 채 밖을 향하게 하고 왼손은 반대로 아래를 향하고 있다. 불상이 서 있는 대좌(臺座)는 연꽃이 새겨진 8각이며, 하대에는 귀꽃이 높게 솟아 있다. This is kept in Leeum, Samsung Museum of Art and its preservation status is good. 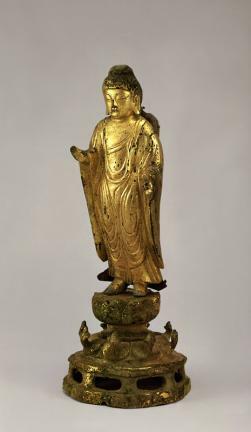 It has a topknot-like large usnisa (protrusion on the top of Buddha's head) on the curled hair and the round face, acute eyes and small mouth give it a solemn appearance. The robe over the shoulders is U-shaped and forms a diagonal line across the wide exposed chest. The pleats of the legs flow in a U-shape to follow the contour of legs. The right hand faces outwards with the fingers spread and the left hand is directed downward. The pedestal on which the statue stands is octagonal with a lotus carving. Flower patterns rise high on the lower pedestal.